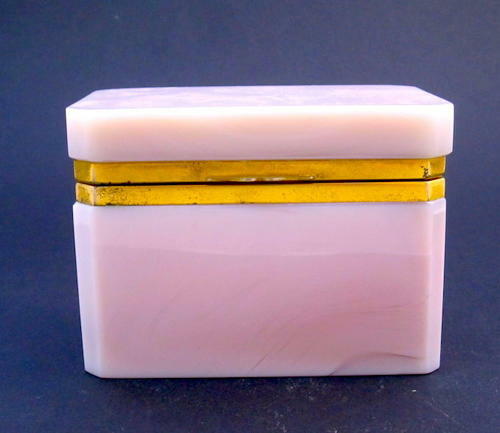 An Unusual Antique Pink Lithyalin Glass Rectangular Casket Box with Smooth Dore Bronze Mounts and Lift Clasp. Lithyalin Glass is an Opaque or Translucent Marbled Glass with a Surface Resembling Marble or Polished Gemstones. It was First Made by the Chemist Friedrich Egermann (Bohemian, 1777-1864) in 1828 in Northern Bohemia and He Patented the Process in 1829.